We recently made a trip to San Francisco’s Japantown to pick up snack food that we prefer to buy there. Before shopping, we sat down with some sushi in the Peace Plaza enjoying some sun and the cherry blossoms. As we bit into a piece of maki, the earthy crunch of daikon radish popped out, complimented by the bite of wasabi and sweet saltiness of nori. We began to wonder if we couldn’t make this into something else to go with a more western style dinner we had planned. A side salad seemed like the best way to go, keeping the simple flavors together while making a vibrant compliment to a main course. We opted to dice the daikon and make a vinaigrette with ginger and wasabi. All the ingredients were less than a block away at Nijiya market. The result is earthy and spicey and at the same time recalls the maki roll we had in the plaza. There are mountains of spring peas at the farmers markets these days and the brief window of their availability makes us savor the spring weather a little bit more. 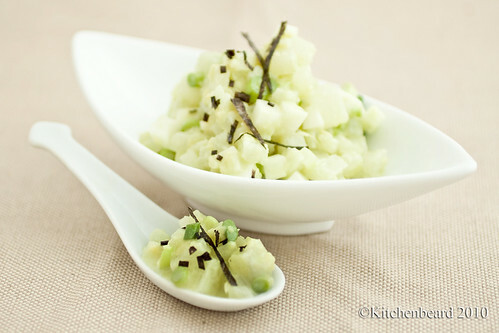 Mint and lemon add another level of freshness to the peas and can be added in a multitude of methods. While steaming them and coating them in butter is a classic method, we like to do as little to them as possible and just let the natural sweetness shine through on its own. We got ours at the Ferry Building Farmers Market where some pre-shelled peas were available but we bought ours in the pod and snagged a bunch of mint at the same stand. Before heading home, we stopped in Cowgirl Creamery and picked up some ricotta from Bellwether Farms.